New to Baltimore but not new as a culinary instructor, Chef Scott Ryan has recently opened the Baltimore Chef Shop cooking school in Hampden. Chef Ryan has been a culinary instructor since graduating the Cambridge School of Culinary Arts in Massachusetts well over 10 years ago. 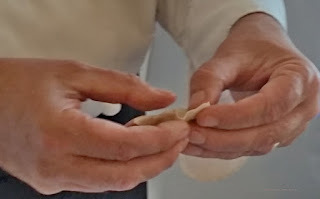 During the Dim Sum class that I attended, the chef and I shared a moment fondly reminiscing about a common acquaintance, the founder of the Cambridge School of Culinary Arts, Roberta Dowling who recently passed away. Chef Ryan has taught the culinary arts in multiple cities while moving about the country supporting his wife’s career. They have set down roots in Baltimore and truly focused on his career as a culinary instructor. Initially, the classes were held in his house until his school recently opened on ‘the Avenue’ in Hampden.